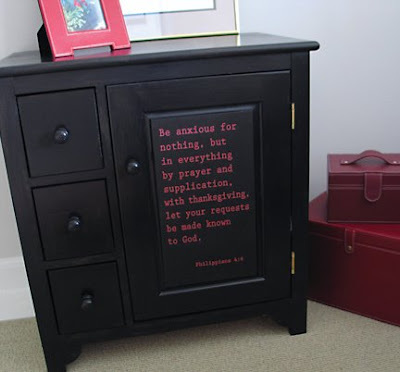 If you have my book, Inspirational Home, then this little piece of furniture might look familiar: It was a cabinet I had painted black and decoupaged with a scripture for the office in my previous home. It's also one of the many projects described in my book. This cabinet recently moved into my newly created studio in this home and the red type just wouldn't do anymore. I ripped it all off, then contemplated how to redo it. Different font? Different verse? Here's what I decided: I used a "fancier" font, added a little ornament at the top, but kept the same verse. I just love this scripture and it's something I NEED to be reminded of daily. 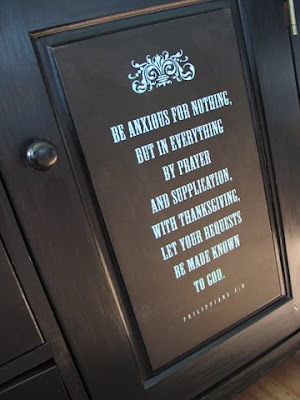 "Be anxious for nothing, but in everything by prayer and supplication, with thanksgiving, let your requests be made known to God." Philippians 4:6. I printed my design - of aqua text on a black background - on two sheets of paper (because one wasn't big enough.) I glued/decoupaged them onto the cabinet door panel, seaming them carefully. When they dried I went over the top with more decoupage glue to seal. [Be sure to do a test with your paper/printer/glue before applying to the cabinet so your ink doesn't run.] Yeah! Check another "todo" item off my list! PS: Just two more days to enter my 5-prize Giveaway! See this post to enter. Thanks for all the links and kind words everyone!! FABULOUS!! I love that idea! Oh, wow, I love that! I have a similar dresser in my bedroom that I've been meaning to repaint forever, but was waiting for inspiration to strike. I think it just did - thanks! Did you just print the words onto plain black paper? Did you use cardstock? 1. Decoupage is basically just gluing under and over your material. In this case, glue your paper to the wood. When it's dry apply more decoupage medium (you can buy many different brands that are called "decoupage") or simply use Elmer's glue mixed with 1/3 water. Test first, because some printers with some glues might smear. 1. I printed the text with a black background onto a heavy smooth text sheet - not card stock - that's too thick. Cheap copy paper is a little too thin. Most scrapbook papers are a good middle-weight. 2.I don't know of a printer that will print light colors onto black paper. don't forget to send me pics of projects you do! I'm collecting them and would love to post follow-ups some day! What a great idea!!! Thank you for sharing! Definitely have to get a copy of your book! It looks gorgeous! 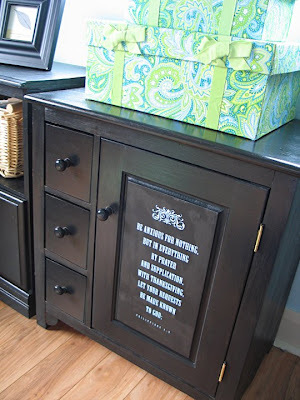 I love the cabinet re-do! Great idea! Thanks for the inspiration! Hey, Jeanne!It's beautiful! I am still confused about the paper!Sorry! Ok, use a scrapbook weighted paper that is black??? Not sure about the black back ground that you mentioned. Do I set that on the computer as I print? Duh??? So sorry! Kindergarten teacher needing very simple simple directions! Hop over to my blog if you have a minute--I have a decorating dilemma!! thanks too for answering all the questions - it's such a treat to get that feedback! I love how totally different it looks now. Same great idea, but modified to suit your altered tastes! I love the new font and I especially love the flourish at the top! This is so wonderful!!! I definatly want to do this. In your document make the background black and put colored text on top. Print that all out on a white sheet of paper. I just love everything you put your hands on lady! Thanks for sharing this, it is truly inspiring. How neat. I don't have your book yet, but am going to check it out real soon. I love the cabinet. And how ironic, at group today we talked about Phil 4:8. I've since made a card of 4:4-9 to carry with me every day. I too need that great reminder. Love the redo. Looks super! I LOVE that! I really like the new look of it, especially with the design above it, very lovely! Love the cabinet ! How were you able to remove the scripture writing and redo it ?? I removed the previous decoupage quite easily once I got the edges started ... one large sheet had been glued on. It mostly came off in one sheet, but had to sand the edges a bit to get it ready for the re-do! Thanks for the question!